Discounts of 35-43% are Live! From April 28th , all the dealer pricing restraints have been removed by the manufacturer of Lindon Farms foods! This sale has only been offered once in their 15+ years in business- we don't expect it to happen again. Discounts of up to 43% are now in force ... and of course FREE shipping to the lower 48 states. ALSO-an automatic FREE lifetime Safecastle buyers club membership with any Lindon Farms purchase (if you are not yet a member) -- a $49 value! Lindon Farms foods are highly regarded in the marketplace ... veggies, fruits, meats, entrees--it's all delicious, with a shelf life of 25 years, without carrying the high-end list prices of some other brands. Discount sale prices are rare, and they have never been this low, across the board! If you recognize the urgent need to shore up your personal preparedness, you will want to take advantage of this truly unprecedented money-saving opportunity. Shop Lindon Farms foods now. This Lindon Farms sale is going to deplete manufacturer inventories at some point--maybe very quickly. So if you want your food delivered as promptly as possible--get your order in early. If you get your order in near the end of the sale, you will get your food, but it might be longer in coming to you if the backorder situation at the factory that I expect with this sale does come to fruition. Looking for Non GMO , Gluten Free products ? A genetically modified organism (GMO) is an organism whose genetic material has been altered using genetic engineering techniques. Organisms that have been genetically modified include micro-organisms such as bacteria and yeast, insects, plants, fish, and mammals. GMOs are the source of genetically modified foods and are also widely used in scientific research and to produce goods other than food. The term GMO is very close to the technical legal term, 'living modified organism' defined in the Cartagena Protocol on Biosafety, which regulates international trade in living GMOs (specifically, "any living organism that possesses a novel combination of genetic material obtained through the use of modern biotechnology"). 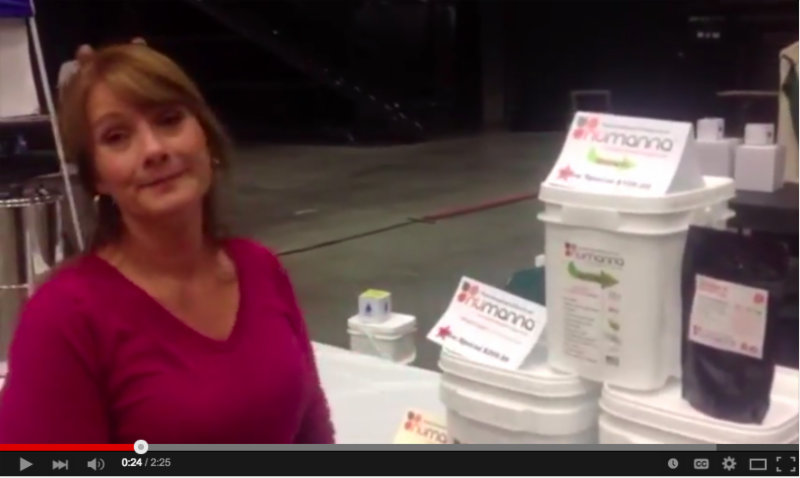 Check out a Video on Numanna. Lowest Prices, Loyalty Rewards, Free Giveaway!! What are you waiting for ? This is for limited time only. So Hurry !! Purchase has to be single transaction for volume discounts. With every purchase of $350 you get a knife free. Bucket Dimensions: 10" x 9.25" x 13"
Why hassle to stock food time and again when you can stock up once and be relieved!?! 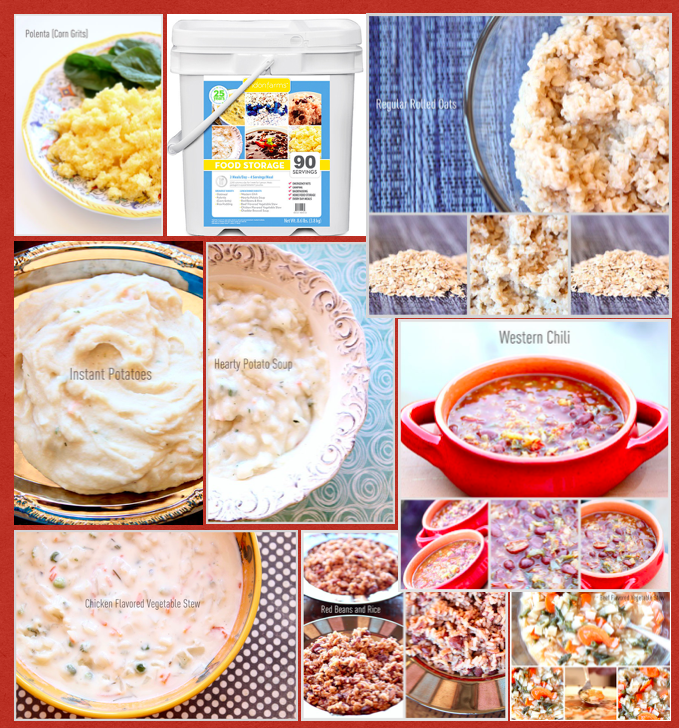 Most comprehensive and complete Meal Plan for a family. Optimized for the right Calorie Count. Includes - Meats / proteins, Grains, Fruits / Vegetables, Dairy and Others. Your favorite CHICKEN BREASTS are back! When you buy a case of Pork Chops ! Labels: butter, canned cheese, canned food, cans, cheese, chicken breast, Chocolate Milk, clarified butter, food shortage, freeze dried food, future essentials, pork chops, storage food, Why prepare? We did a sale earlier this year and these went out of stock quickly. We could not keep up with demand and had to turn down orders. Here is another chance. Don't miss out. 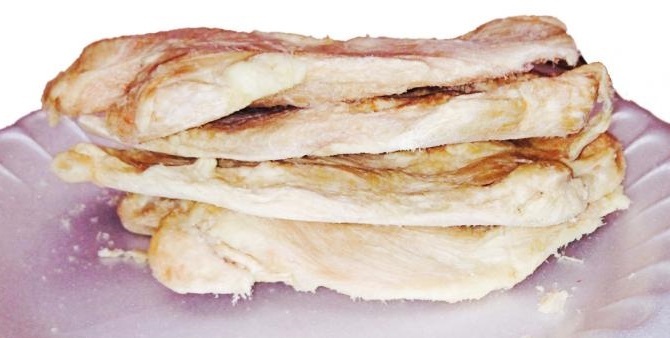 These Freeze Dried/Uncooked Boneless Chicken breasts come approximately 4 to a can. All are hand-trimmed. All cans were sealed in an oxygen/moisture free environment. You can have great tasting food in seconds with no mess and no waste - and it doesn't matter if the power goes out!! You can open just one can at a time and in 20 minutes cook one or as many of these as you want however you would cook any other fresh chicken breast!! Perfect for camping, boating, traveling, or at the cabin. No Additives, Preservatives or Colorings. Labels: canned food, cans, chicken breast, cooking, food shortage, freeze dried food, How to be ready, long term food, Natural disaster preparedness, Prevention, Why prepare? 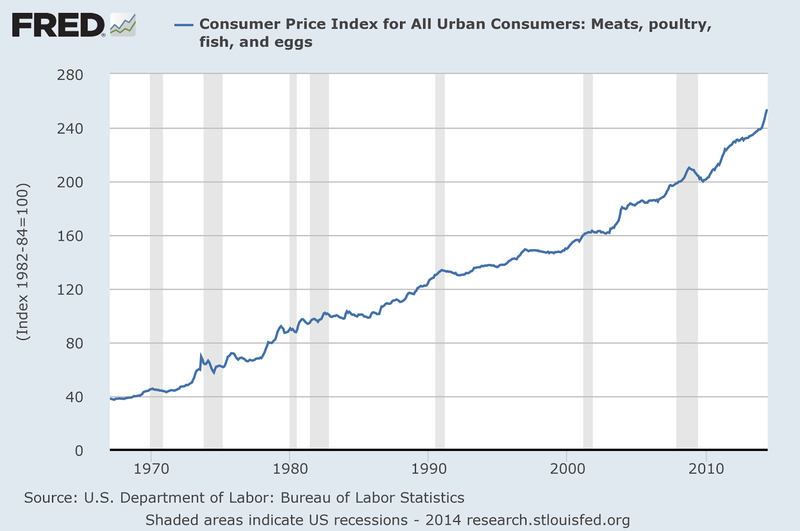 Consumer Price Index for Meats , Poultry, Fish and Eggs is a telling story.. how do you lock in these rates..
You've seen the news ... virtually all food prices are rising fast now. Food inflation is becoming a major issue. There's really only way to take immediate productive action to protect your household, and that is to lock-in today's prices by purchasing foods.